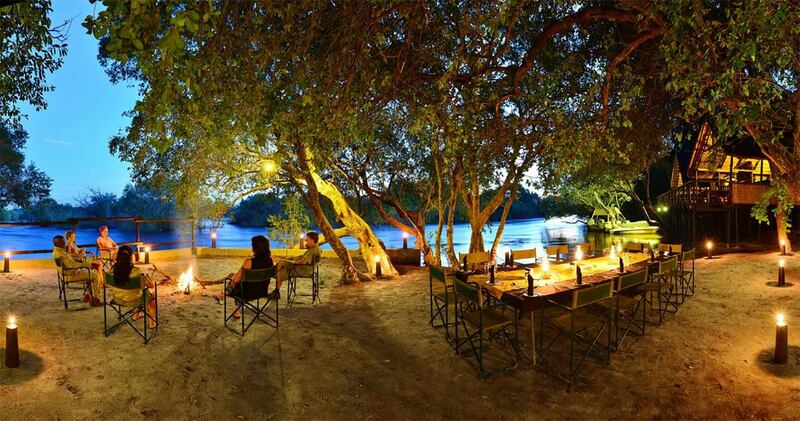 Located on Impalila Island on the Namibian side of the Chobe River - which lies at the confluence of the Chobe and Zambezi Rivers - Ichingo Chobe River Lodge is a beautiful tented lodge that guarantees a tailor made holiday for you. Friendly and owner-managed, it is secluded and hidden beneath the riverine forest, providing the perfect platform to explore this diverse region. 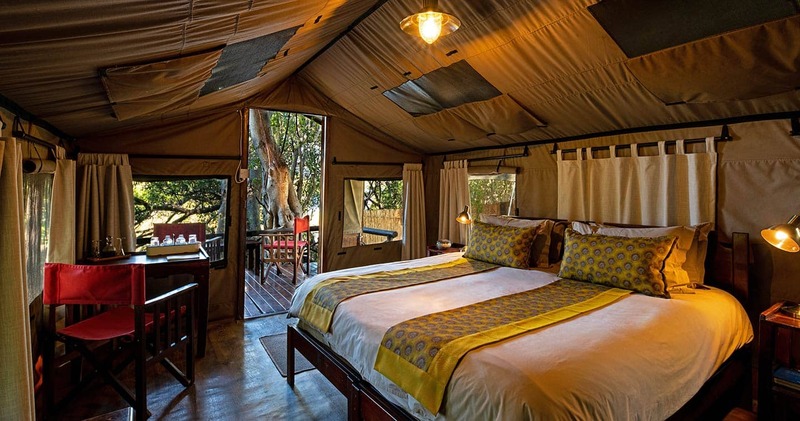 The combination of breathtaking scenery, guides that know every nook and cranny, barman Kennedy who makes sure you are never without a fresh drink, abundant wildlife, and a ton of safari activities to pick from, turn this place into a unique safari haven. 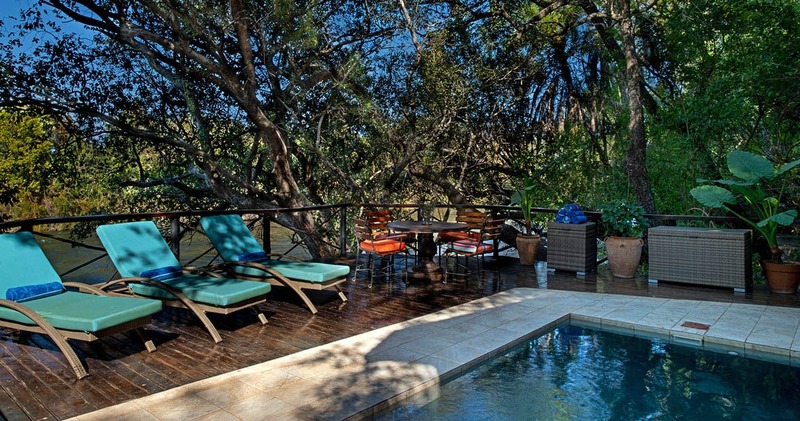 Located on the river banks, this lodge is set on the ideal location if you are seeking a fishing or river safari. 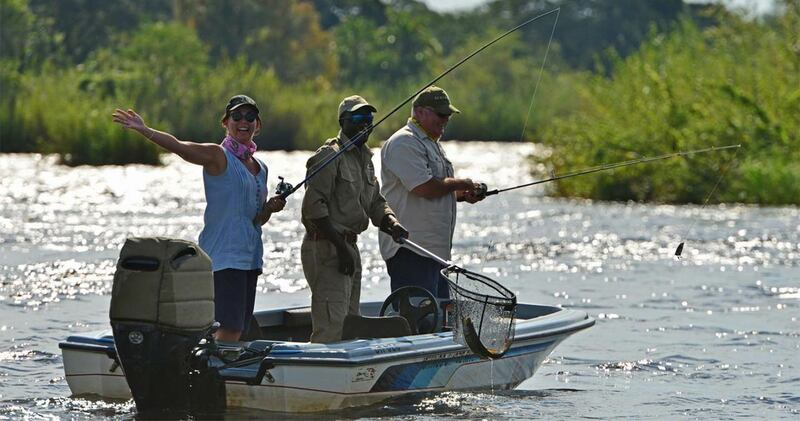 The lodge’s location is known for its high quality fishing, but even if you are not much of an angler, a river safari will add dynamic and unforgettable snapshots to your previous globetrotting experiences. By spending time on the majestic rivers, you will be eye-to- eye with wildlife quenching their thirst and see them in the most placid, undisturbed way. 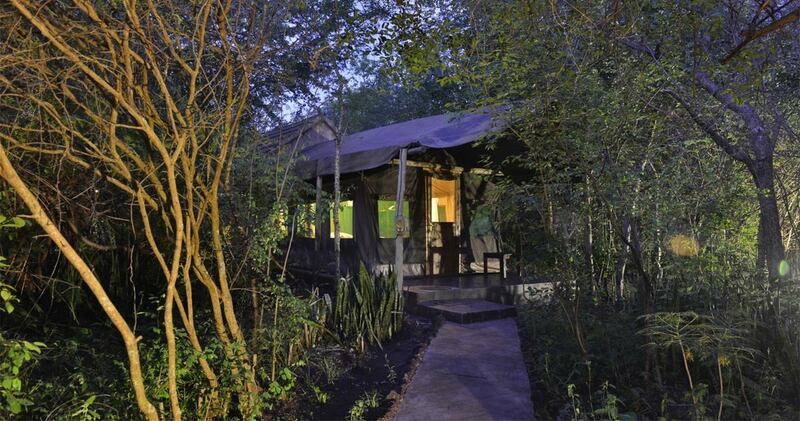 Stone lined sandy pathways lead to the eight well-appointed Meru-style safari tents with private balconies and en-suite facilities that include a large walk-in shower, vanity basin and flush WC. The tents are privately set and shaded by jackalberry trees with canvas walls incorporating gauze windows. Step out to your own private balcony to listen to the rapids, relax on your sumptuous bed and then head to the dining room or bar to share stories with others or soak in river views with a glass of African red wine. This is also where you come to enjoy great food by local chefs. 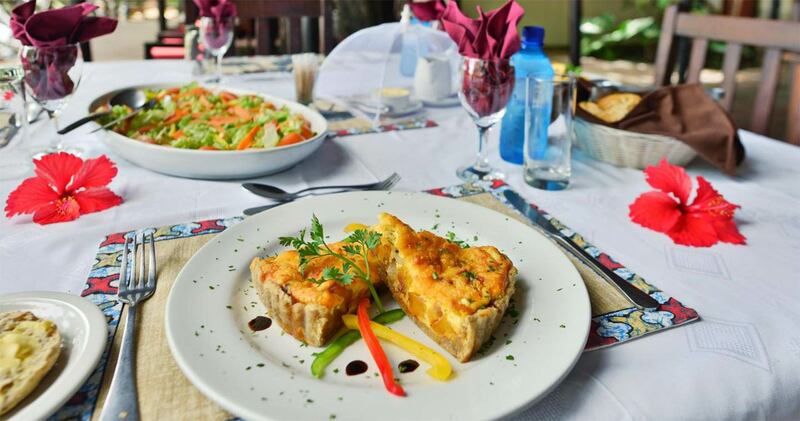 Quiches, soft homemade buns, salads chock full of fresh produce: it is all a real treat for the taste palette. The communal guest areas are perched on wooden platforms raised on stilts above the water. The lounge, bar, library and dining areas are under thatch and open sided. Comfy couches and colourful chairs create a relaxed and homely atmosphere, dinner is enjoyed around the large square dining table and there is a secluded swimming pool on the water’s edge. Here, attention to detail is paramount. 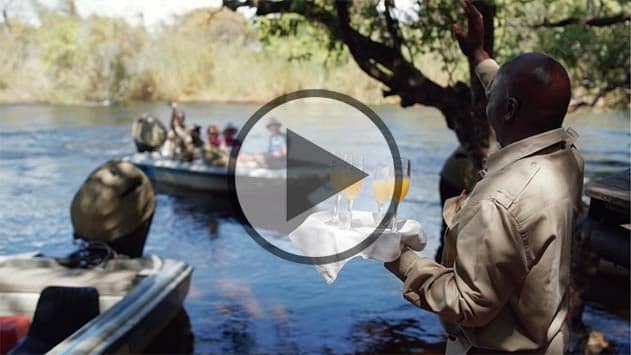 From its unique geographic location that allows boat-access to over 100 kilometres of prime water on the famed Chobe and Zambezi Rivers, you can enjoy year ‘round fishing, including the thrill of landing the hard-fighting tiger fish. Game viewing by boat is another unique experience, as wildlife is more tranquil in its aquatic habitat. Get close to hippos, crocodiles, big elephant families, buffaloes and many more. To feel even more grounded, sign up for a guided walking safari: together with a skilled team of guides, you will find new discoveries with every step. The smells of fresh grass and soil and sounds of animals all around you will open up your senses like never before. Sounds thrilling, doesn’t it? Afterwards, you definitely deserve a relaxing sunset river cruise, accompanied by ice-cold sundowner drinks. With over 400 bird species, bird watching is great on every safari activity. (It is actually already great from your own private deck, all you need is a pair of binoculars) If desired, you can also contribute to the community development program which funds the administration and sponsorship of various school activities of the island’s tribal inhabitants. One thing is certain: you will leave this lodge with a collage of memories and an everlasting love for this region. Ichingo knows how to do it right. A high level of personable experience customized to your specific needs. They provided a high level of personable customer service from the General Manager down. They attend to all the details! Our guide, Robert, was the best guide to have in the Chobe. Very patient and informative. The barman, Kennedy, is always friendly and made sure that we were never thirsty or without a drink. Rooms were clean and neat, but can do with musquito nets. And a more luxurious update. The staff were all super friendly and the views of the river was stunning. Local chefs made the best food with every meal. From starter to the dessert. From 2017, Ichingo Chobe River Lodge will offer a two or three night itinerary, which includes a variety of activities: don’t hesitate to ask us for more information. Read all about travelling to Ichingo Lodge on our getting to Chobe page. Children of all ages are welcome at Ichingo. Children under the age of 12 years pay 50% of adult rate. Children 12 years and over pays full adult rate. At Ichingo they can put an extra bed into the tent for 1 x child to share with the parents. If there are 2 adults and 2 children then they can either do 1 x double 1 x twin or 2 x twin (1 x adult, 1 x child). We hope you have found all information needed to decide that Ichingo Chobe River Lodge in Chobe National Park is the perfect place for your next travel adventure. Please fill in the contact form and we will get back to you soon!